The "T" stands for "tapered." Can anyone help me with the estimated time frame of the following Rawlings tags? This may be off this topic. I have a 2 Rawlings College baseball game used player jersey. I am trying to figure out the year it is from. No Year tags on both. No name on back of each jersey. I think the wash tags may help. 03K Adult WKBDS WPL 3957 CA 21081 MADE IN THE USA. Rawlings The Mark of a Pro L (Large) tag. 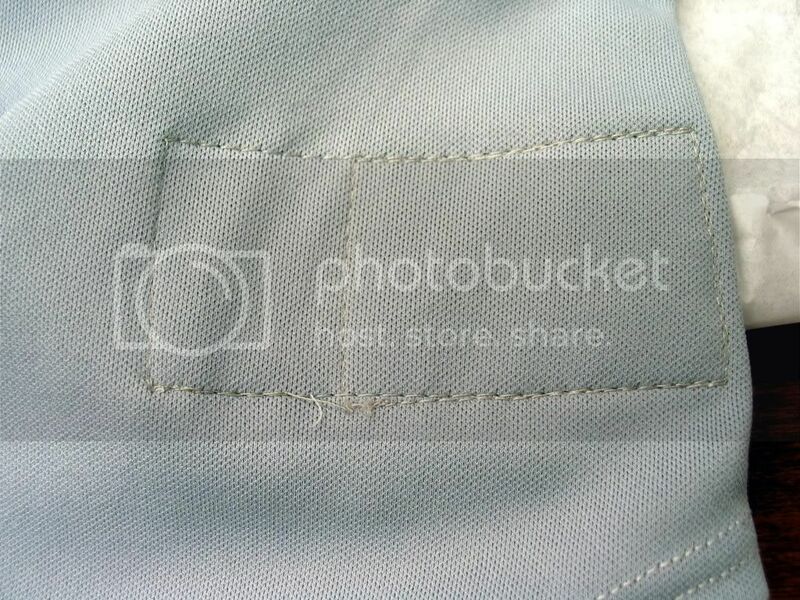 R logo circle left sleeve. 03B (2nd jersey) Rawlings logo script in blue left sleeve. One tag front size Adult 44 back wash tags. I am thinking 03K & 03B is the codes for the year and month. Please help. Thanks B.F. 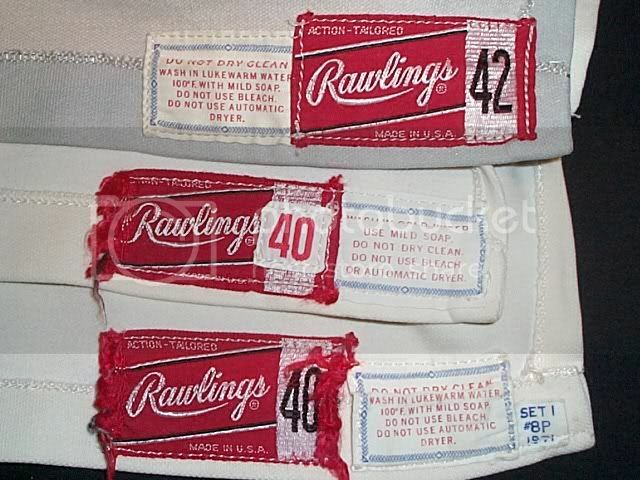 I'm looking for examples of laundry tags included in 1972 Rawlings jerseys to help me prove or disprove a theory. I recently acquired a group of older Cardinals jerseys and noticed the laundry tag in one was worded differently than any I'd seen before. This particular jersey didn't have a year flag (not unusual on '71-'72 Cardinals jerseys), but it was worn by Ed Crosby, who played for the Cards in '72 but not '71. I think it's possible that 1972 Rawlings jerseys have a unique laundry tag -- and if they do, it would make it possible to differentiate a '71 shirt from a '72 shirt even if they don't have year flags. Note: The Cardinals wore flannel through the '70 season. 1971 was the first year for knits. Their jerseys had crew necks in 1971-72; by 1973, they switched to a "V" neck. In 1973, Rawlings eliminated the separate laundry tag and included washing instructions on its regular red tag. Here's a shot of three tags from 1971-72 era Cardinals jerseys. The top one has a laundry tag with "traditional" wording (i.e., used during the late '60s through at least '71) and no year flag. The middle jersey has the "nontraditional" wording and no year flag. The bottom one has both the traditional wording and a '71 year flag. The "traditional" wording is: "DO NOT DRY CLEAN. Wash in lukewarm water, 100 F, with mild soap. Do not use bleach. Do not use automatic dryer." The "nontraditional" wording is: WASH IN COLD WATER. Use mild soap. Do not dry clean. Do not use bleach or automatic dryer." It may be telling that the recommended water temperature was changed from "lukewarm (100 degrees)" to "cold." On 1973 tags, the instructions call for "cold" water. Maybe somebody realized that knits needed to be washed in colder water than flannels, so the laundry instructions that carried over from '70 (flannel) to '71 (knit) needed to be changed. 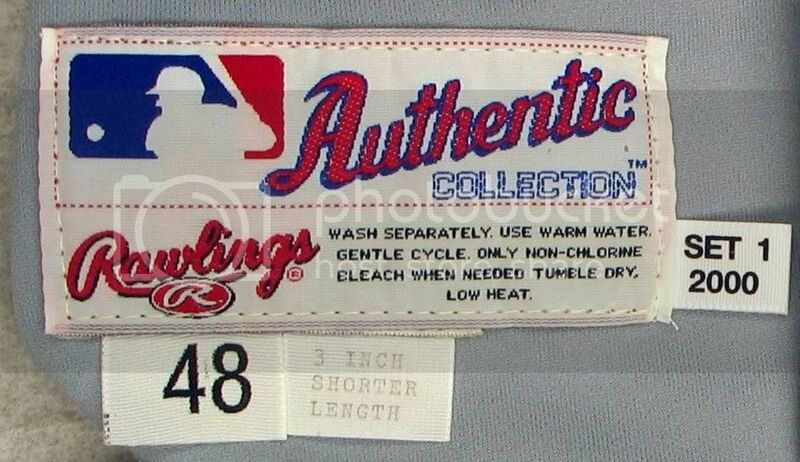 If you have a Rawlings jersey that can be pinpointed to 1972, I'd appreciate it if you could share photos of the laundry tag. Thanks! I have seen several examples of 1972 Rawlings Jerseys that have no wash tag and actually are the 1973 era labels as depicted originally in this post. There may have been some of the older labels used on jerseys in 1972, however there are also a number of the newer labels used as well. I have a 1972 Rose in my own collection that has the new label. Also, I was able to find two other examples supporting the argument that the new label was in fact intoduced in 1972 vice 1973. Attached is a 1972 Lou Brock Jersey and 1972 Clemente Pants. The 1972 Rose does not have a year tag which is exactually as it should be and is the only Reds Home Jersey that did not have a year tag during the 1970s era. Came across this interesting Rawlings label today and thought I'd share. Actually, I saw two Cardinals jerseys tagged the same way. The visible label is the version adopted in 2000, but it clearly was sewn over the 1999 label by Rawlings (given the provenance, I can guarantee these jerseys were not doctored after the fact). MLB logos also were added to the back collars for 2000. This jersey looks to be an early 1970s salesman's sample, given the the tag design and the straight cut tail, a Rawlings staple for the first few years of the knit era. The #26 was worn by Boog Powell at the time, who was a size 50 on most of his knit jerseys. The ocagon-shaped tag also is exclusive to salesman's samples.